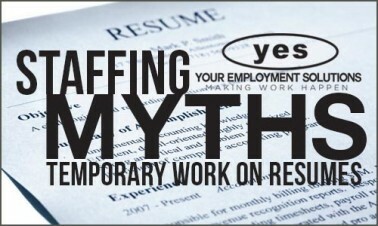 There are many myths about the Staffing Industry. In our modern world of free-flowing information (full of fact and opinion) that can be said about almost every industry. Your Employment Solutions has been Utah's best choice for staffing services since 1995. A big part of what makes YES the best in our industry is our commitment to being honest and open in business. This policy is embedded in the organization from the strong examples of YES's leaders Reed Laws and Kerry Westenskow. Continuing in that tradition of honesty and transparency, here is the third in a series of staffing myths blog posts meant to clear up any potential staffing myths you might hold. If you've ever considered working with a staffing agency, but were unsure about it for any reason, my hope is that these posts clear up any of your doubts. Does it look bad on a resume to have worked with a staffing agency? No. Working with a staffing agency is akin to working with any other type of reputable business. Staffing jobs provide regular work experience, and that is what your resume will reflect. But doesn’t temporary work show lack of commitment? Just the opposite. Temporary work can help you gain and develop skills and real-world experience — which will strengthen your résumé. If you’re unemployed, working a temporary job with a staffing agency can help you bridge the gap and strengthen your skills (or keep them sharp) until you find that long-term opportunity you’re looking for. It can show initiative, a positive work-ethic, and a commitment to the value of work. Will a company ignore me for having worked with a staffing agency? Many major employers use staffing agencies as a cost-effective way to screen new employees. Remember, not all jobs in staffing are temporary. In a lot of instances, working with a staffing agency can be your way “in” to a promising career with a reputable company. Some companies use employment staffing agencies to make sure you’re a good fit to their culture. Your goal in your job search is to show potential employers how you can benefit their organization. Working with a staffing agency can provide you that opportunity to prove your value in the marketplace. I hope this post helped answer any questions you might have regarding pay in staffing or at least cleared up some of the more common myths. Other staffing myths posts in this series cover the topics of employee fees, types of jobs in staffing, staffing pay, and more. If I missed anything you'd like to know about, please leave a comment and let me know!